ResizeKit2: Automatically resizes controls and fonts on your forms. No coding necessary. Resizes most third party controls. 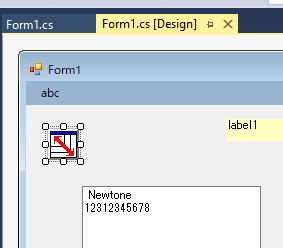 ResizeKit2.NET (for Visual Studio Windows Form) New! ResizeKit2 10.3 Rio Editions Are Now Available! The ResizeKit2 trial versions are fully functional and can be used to test the ResizeKit2 performance before you purchase the retail version. All ResizeKit2 trial versions display a nag screen when the form is resized. The ResizeKit2 .NET trial version stops working after 30 days. * The ResizeKit2 VCL trial version contains all VCL editions of the ResizeKit2 for all supported programming environments. However, the ResizeKit2 retail versions are each sold separately, requiring a separate license for each programming environment. ResizeKit2 editions for Delphi XE2 and above and for C++Builder XE3 and above support 32 bit and 64 bit applications. All older ResizeKit2 editions support 32 bit applications only. Just place the ResizeKit on your form! The ResizeKit 2 is a control that automatically adjusts the size of the controls and fonts displayed on the form when the form size changes. Programmers can write applications that do not depend on screen resolution or that adjust to size changes by the user, often times without writing a single line of code. Even if the user switches the screen resolution while the application is running, if that screen resolution forces the form to change size, the ResizeKit control detects it and automatically adjusts the size of the controls and fonts on the form. The ResizeKit2 is easy to use, simply place the control on the form at design time. It can be used immediately from the first day you without changing the program design or code in your existing programs. ResizeKit 2 VB is a fast and lightweight ActiveX control adopting ATL adopted for VisualBasic 5.0 and 6.0. 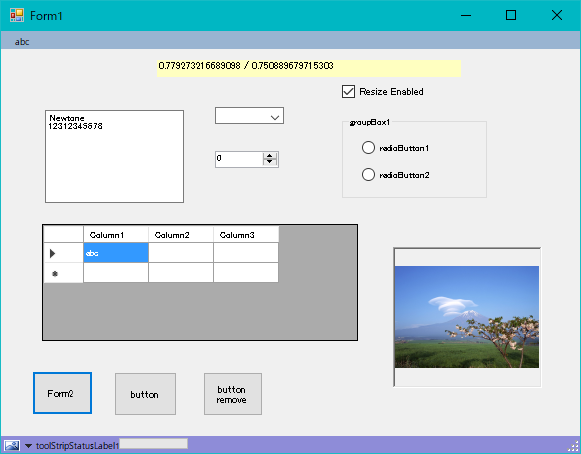 The ResizeKit2 Delphi, ResizeKit2 C ++ Builder, ResizeKit2 BDS, ResizeKit2 RAD Studio is a VCL component corresponding to each VCL language version. 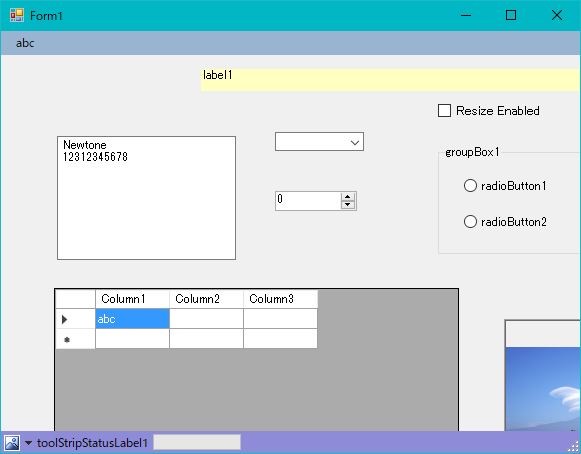 The ResizeKit2 .NET is a .NET components for NET Windows Form applications. The ResizeKit2 developer license allows the license holder to make as many runtime applictions as they wish and, because the runtime license is free, the license holder can distribute as many of each runtime application as they wish without additional royalties or fees. The ResizeKit2 can resize most standard control whose left, top, height, and width properties are accessible. Even some third party controls that do not specify left, top, height, or width properties or controls in which these properties are insulated from size changes can be resized by the ResizeKit. The cells in Grid or Spread applications are some examples of this. In these cases, the controls or fonts can be resized by specifying the dimensions of the control or font in the ExitResize event. A simple sample program illustrating the code used in the ExitResize event is included with the ResizeKit. Note: There are third party controls are can not be resized using the ResizeKit2. Please download and test the ResizeKit2 trial version, which is fully functional, before you purchase the product. If you have any questions, please let us know. Automatically resizes all controls and fonts on the form. Simply place the Resize Control on the form. No need to redesign or add additional code. Create applications that are size and screen resolution independent. Maximum and minimum form height and width can be specified. Initial location of the form can be specified. Controls and fonts can also be excluded from resizing. Runtime royalty-free license. Distribute unlimited applications. 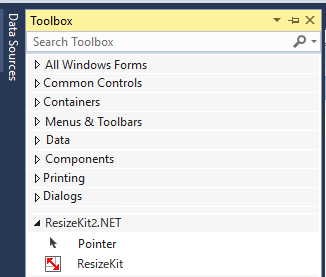 The ResizeKit2 .NET is a Windows Form applicable .NET component New! The ResizeKit ActiveX component is based on ATL so it is fast and lightweight. The ResizeKit VCL component has unified .EXE so applications can be distributed in one simple unit. Resizes most third party controls without the need for additional code. Contains easy to use properties and its ExitResize event allows you to customize the resize process. Useful sample programs are included. If you reduce the size of your form without using the ResizeKit, the controls and fonts on your form are hidden beyond the form's right side and bottom borders. In some cases, controls or fonts cannot be automatically resized. Third party controls that do not specify left, top, height, or width properties or controls in which these properties are insulated such as the cells in Grid or Spread applications are some examples. In this case, these controls or fonts can be resized by specifying the dimensions of the control or font in the ExitResize Event. The ResizeKit includes sample programs to illustrate how to do this. * In the ResizeKit2 .NET, the size of the grid control and the font size in the cell are subject to resizing, but for the cell size use the "AutoSizeColumnsMode" and "AutoSizeRawsMode" properties of the control. The ResizeKit2 allows you to set the position and size of the initial display of the form (VB, VCL version only), whether or not fonts are resized, the maximum and minimum sizes that the form can set. Runtime applications, developed using the ResizeKit2, can be created and distributed without limit or additional royalties. However, this is limited to developers who hold a valid developer license for the ResizeKit2 and who have registered that license with us. To register please refer to our user registration page. Note that distribution of software created as "reusable components (ActiveX control, DLL, .NET, etc.)" using the ResizeKit2 requires a Redistribution license. For more information, please refer to our licensing page. For the "ResizeKit2. NET" edition, software activation (license authentication) is required. License activation confirms that the proper number of development licenses are being used. License activation is simple and takes a few seconds to perform. It is usually completed at the time the ResizeKit2 .NET is installed, but activation can be delayed for up to 2 weeks after installation. If the license is not activated within this two week period the ResizeKit2 .NET can not be used for developement until the license is activated. * In order to activate license, Framework 4 or higher must be installed on your PC. ResizeKit2 C++Builder XE2 C++Builder XE3 for Win 32 ONLY! Multiple licenses packs are available at a significant discount.